Rooms, services Hotel Marie Luisa Prague is offering 30 comfortable rooms to guests looking for accommodation in Prague. You may taste delicious, fresh meals in the restaurant of the hotel every day. Available wellness services will provide you the opportunity to refresh yourself, an outdoor pool will also be waiting for you. If you love spending your leisure time actively it may be a good idea to check the tennis opportunities nearby. Free wireless Internet connection (WiFi) is available in the rooms, ensuring that you can stay up-to-date during your holiday. 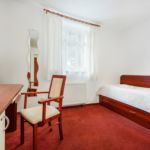 An exact and detailed list of equipment in the rooms and of the services provided by Hotel Marie Luisa Prague you will find on the information sheet below, including any applicable additional fees.